Cinco de Mayo is just a week away and all I can think about is Mexican food. One of my favorite latin treats are churros. Although we associate these delicious treats with Mexico, its history is unclear. It is suspected that it actually originated from Portugal. Hands down, my favorite churro is from the happiest place on Earth, Disneyland. I don't know what the current price is, but I can tell you that it's worth it. We probably eat our weight in them during our visits. 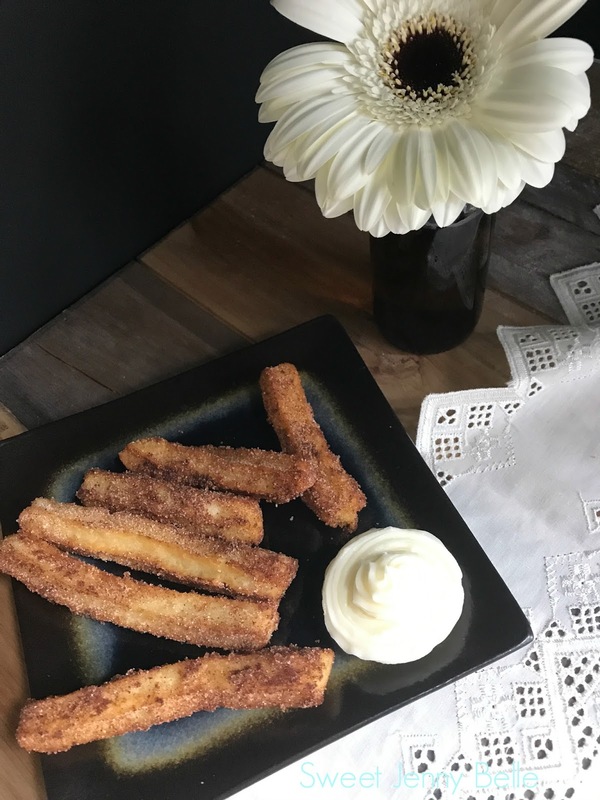 Churro dough is not particularly difficult to make, but it does require your concentration as it is unlike cookie and cake batters. The batter is created in a pot on the stove and will need to cool down before you beat in the eggs. The eggs are added one at a time and beat them quick. Hot dough plus raw egg can equal an interesting omelette - yuk! Whip them in quick and move on to the next one. This was my first attempt at churros, but certainly not my last. These are so yummy! After I created the dough, I placed the batter in a pastry bag fitted with the 1M tip. They are skinnier than the average churro you are used to seeing at the stands, but it was perfect for a treat at home. When I squeezed the batter into the hot oil, I had a pair of kitchen shears on hand to cut the dough at my preferred length. You will fall into a rhythm with this process. 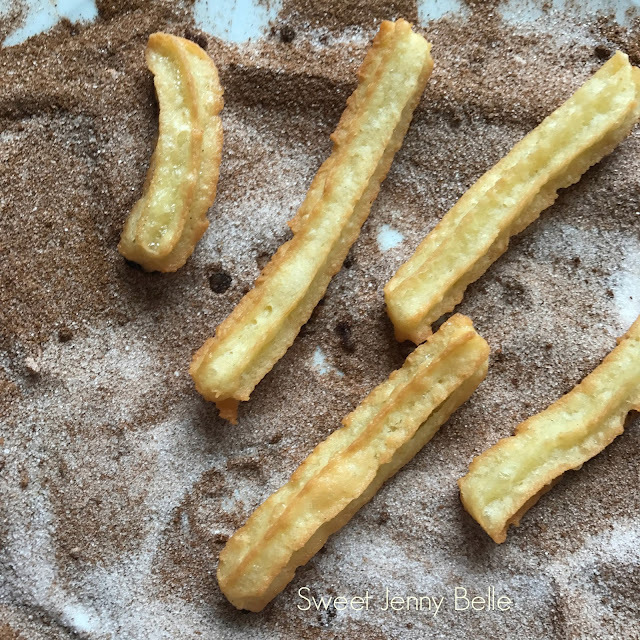 A few friends told me there is an easier way to create them, a churro press! I checked one out and it's in my shopping basket now. There is a nice hard case for all your dough and multiple nozzle heads, including a hollow one for filled churros. Imagine my lime buttercream inside or maybe a spicy chocolate ganache. Mouth watering! 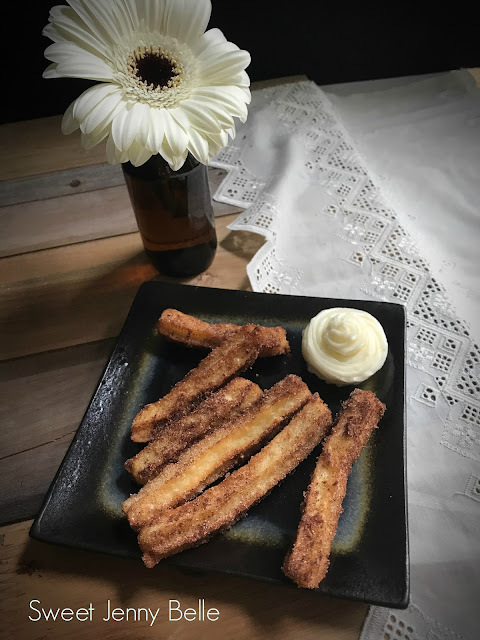 These traditional fried churros are the perfect combination of crunchy, sweet with a soft dough center. Serve this with a side of hot chocolate sauce or lime buttercream. In a medium pot stir together sugar, butter, water and salt. Bring to a boil over med-high heat. Once the mixture has started to bubble, reduce the heat to low. Carefully add the flour while the mixture is cooking and whisk in till well combined. Continue to cook for another 3 minutes and then remove from heat. Allow the dough to cool for 30 minutes. Beat in one egg at a time. Blend it in quickly so the heat from the dough does not cook the egg. Heat oil to 350F in a heavy frying pan. Fill a pastry bag fitted with a 1M tip with the churro batter. Squeeze long strips into the hot frying pan. (I had kitchen shears on hand to easily snip the dough off) Fry until the churros are a light brown. 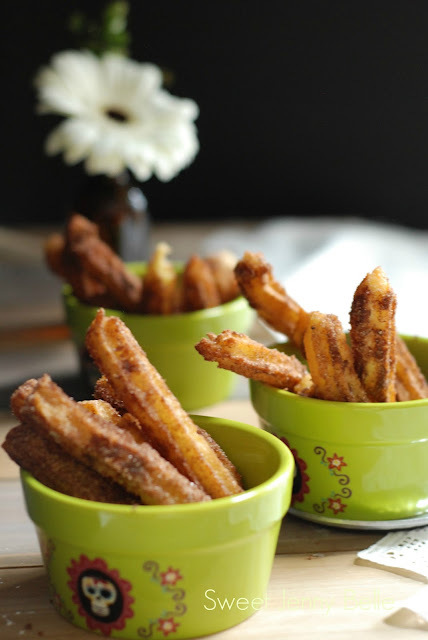 Remove the churros and dip into cinnamon sugar. Enjoy! 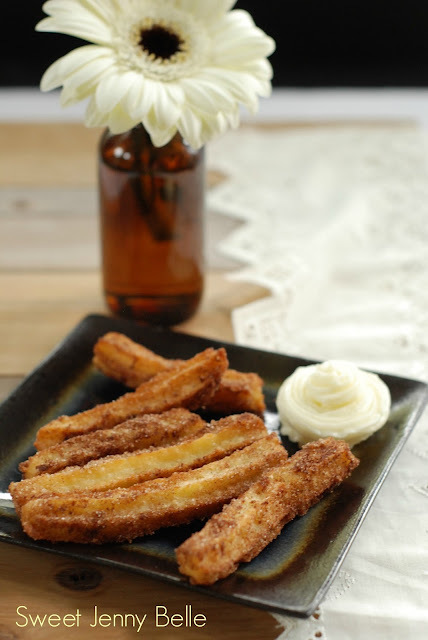 Churros are best enjoyed the day that you make them - they can become soggy if left overnight. They are delicious on their own or pair it with a large dollop of lime buttercream. Don't forget to Pin this recipe to make next week for your fiesta!